Nowadays, breast magnetic resonance imaging (MRI) is regarded to be the most sensitive breast imaging modality, both in terms of breast cancer detection and the assessment of disease extent preoperatively. CEDM is a rather novel imaging techniques that also uses intravenously injected contrast agents to visualize breast cancer. The principles of breast MRI and CEDM are comparable, and there is an increasing amount of scientific evidence that indications for CEDM are also comparable. In terms of patient’s tolerance, CEDM was even preferred by patients over breast MRI. 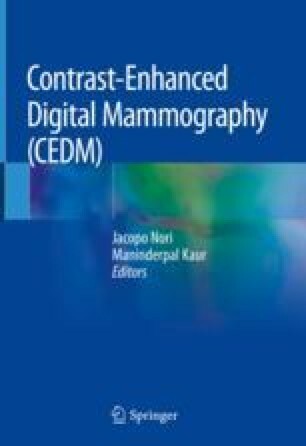 In this chapter, the potential indications of CEDM are discussed and its performance compared to breast MRI.